Prepared in 30 minutes or less plus 1 hour to marinate. Blend parsley, ¾ cup olive oil, vinegar, oregano, cumin, 1 tsp salt, minced garlic, and crushed red pepper in processor until smooth. Place meat in large glass baking dish. Sprinkle with salt and pepper. 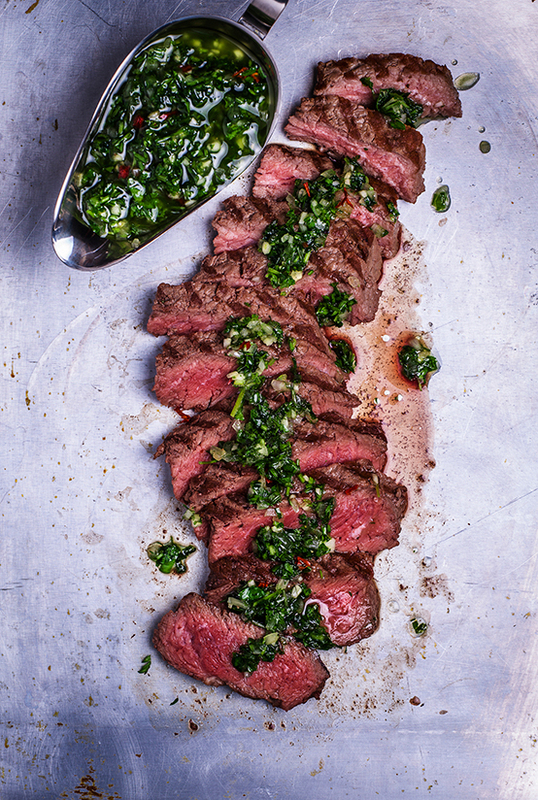 Brush meat with 2 tbs chimichurri sauce. Preheat oven to 450°F. Place bread slices on large baking sheet. Brush with olive oil. Bake until just firm, about 5 minutes. Transfer to large platter. Preheat broiler. Transfer meat to rimmed baking sheet and broil until cooked to desired doneness, about 4 minutes per side for medium. Transfer to cutting board. Let stand 5 minutes. Cut each steak along grain in half. Cut each half crosswise against grain into 10 slices. Top each bread slice with 1 piece of meat. Spread each with some chimichurri sauce; place on platter. Spoon remaining sauce into small bowl and place in center of platter. Serve warm or let stand up to 2 hours at room temperature.